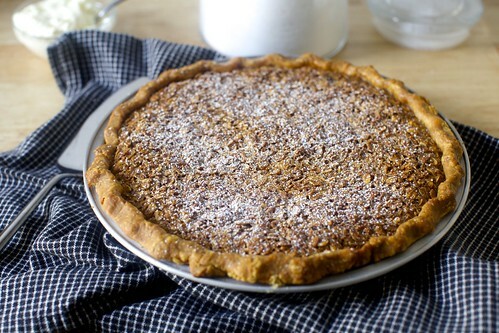 This pie is similar to Pecan Pie and oh so wonderful for any dessert menu. In a large whisk together sugar, flour, cinnamon, nutmeg, ginger and salt. Stir in beaten eggs, corn syrup, melted butter and vanilla until combined. Bake for 45-50 minutes. 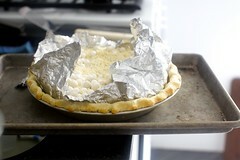 If needed, cover crust with aluminum foil to avoid burning. If you can wait long enough, let cool to allow filling to firm up a bit. Although served warm and gooey with a dollop of whipped cream or ice cream is divine! Because it is not Friday yet. Because you probably woke up before you wanted to, and went to a job that even if you love, is still by definition something you wouldn’t do for free. Pie is an excellent consolation prize. Because yesterday felt like spring and everyone’s 3-month bad mood instantly evaporated. Today you needed a hat and gloves again. And a slice of pie, warmed just enough that a scoop of vanilla ice cream trickles over it. Because if you’re in the Northeast, fresh fruit pies are still months off, which means you get to make pies with chocolate and gooey caramel instead. Notably absent: because it’s almost Pi Day. Seriously, guys, among all of the very compelling reasons to eat pie, the fact that the sixteenth letter of the Greek alphabet sounds like the word “pie” and has a numerical value that resembles the way a single country in the world writes its dates, and that date — 3/14/15 — will fall on Saturday is a bit of a stretch to use an excuse, even for someone who just argued you can and should eat pie just because the temperature dropped 12 degrees. Even the fact that this will be the nerdiest of Pi Days, because the year itself aligns with the fourth and fifth digits in the trillions-long patternless irrational number that represents the ratio of a circle’s circumference to its diameter — you know, I can hear you snoring right now — is awfully convoluted of a rationale, especially when you could just make pie because this one is completely amazing. It’s a staff favorite at Four and Twenty Blackbirds, a pie shop with a seasonal focus in Gowanus Brooklyn started by two sisters that are third generation pie bakers from South Dakota. This says a lot among a menu that includes salted caramel apple, black currant lemon chiffon, grapefruit saltine and salty honey pies, many of which have already achieved cult status. Maybe you even bought their book (you should, you should) that came out in 2013. But if you haven’t made this oatmeal chocolate cookie meets pecan pie, no need to wait for a holiday invented by food media for an excuse. Dubbed the “poor man’s pecan pie,” the oats play the part that pecans usually do (which is also awesome if a nut allergy has been cruelly keeping you from it). But this doesn’t mean that you’re about to inhale a bottle of corn syrup in the name of a pie so sweet, your just bought your dentist another summer home. I mean, of course it’s sweet, but there’s so much else going on here — golden syrup or honey and molasses instead of corn syrup; apple cider vinegar, salt and a pinch of ginger to cut through the goo, and the pièce de résistance, a puddle of bittersweet chocolate at the base that nothing will ever be right without again. Eaten in the tiniest slivers — trust me, there’s no other way — or baked into bars (what I’m totally doing next time), if you’re going to bake a pie this weekend, let this be the one. 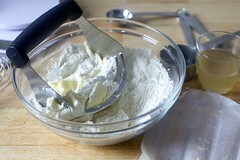 By hand, with my one-bowl method: In the bottom of a large bowl, combine the flour, salt and sugar. Work the butter into the flour with your fingertips or a pastry blender until mixture resembles a coarse meal and the largest bits of butter are the size of tiny peas. (Some people like to do this by freezing the stick of butter and coarsely grating it into the flour, but I haven’t found the results as flaky.) 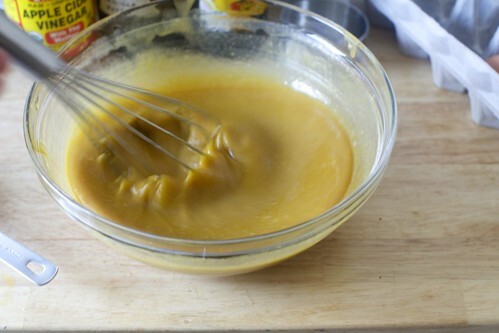 Add 1/4 cup cold water and stir with a spoon or flexible silicone spatula until large clumps form. 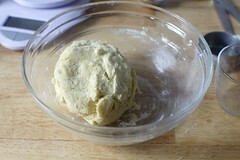 Use your hands to knead the dough together, right in the bottom of the bowl. If necessary to bring the dough together, you can add the last tablespoon of water. Both methods: Wrap dough in a sheet of plastic wrap and refrigerate for at least one hour, or up to 48 hours, or you can quick-firm this in the freezer for 15 minutes. Longer than 2 days, it’s best to freeze it until needed. 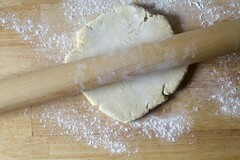 Form the crust: On a floured counter, roll the dough out into a 12 to 13-inch circle-ish shape. 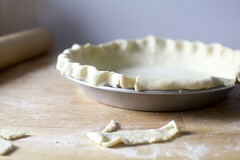 Fold dough gently in quarters without creasing and transfer to a 9-inch standard (not deep-dish) pie plate. Unfold dough and trim overhang to about 1/2-inch. 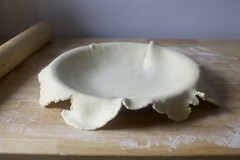 Fold overhang under edge of pie crust and crimp decoratively. If not parbaking, place in fridge until ready to fill. If parbaking, place in freezer for 20 minutes, until solid. Par-bake the crust: [Optional, but will lead to a crispier base.] Heat oven 400°F (205°C). Line frozen crust with lightly buttered or oiled foil. Fill with pie weights, dried beans or pennies. Bake on a rimmed baking sheet for 20 minutes. Carefully remove foil and weights and let cool completely before filling. Heat oven: (Or reduce oven heat, if you just par-baked your crust) to 350°F (175°C). 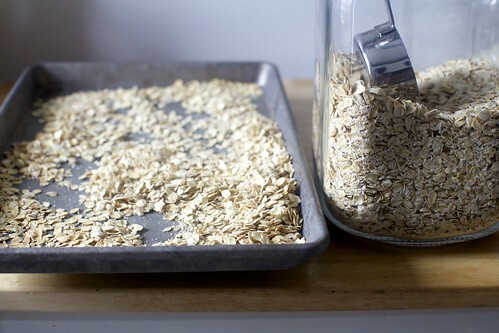 Prepare filling: Spread oats on a rimmed baking sheet and toast in the oven for 10 to 12 minutes, stirring occasionally. Set aside to cool. Reduce the oven temperature to 325°F (165°C). To make the black bottom, bring the cream just to a boil over medium heat in a small saucepan. 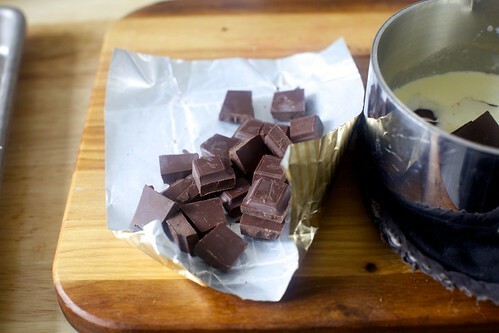 Pour in chocolate pieces and whisk until melted and smooth. 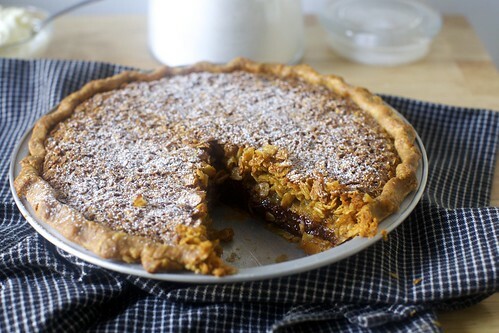 Scrape the chocolate into the bottom of the cooled pie shell and spread evenly. Place in freezer while making the filling. To make the oatmeal layer, in a large bowl, whisk together the brown sugar, ginger, salt, and melted butter. Add the corn syrup, vanilla, and cider vinegar and whisk to combine. Add the eggs one at a time, whisking well after each addition. Stir in the cooled oats. 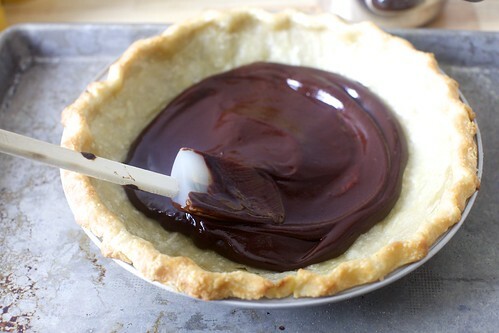 Place chocolate-coated pie shell on a rimmed baking sheet and pour filling over. Bake: For about 55 minutes, rotating 180 degrees for even color if needed halfway through. The pie is done with the edges are set and puffed slightly and the center is slightly firm to the touch but still has a little give — like gelatin. Allow to cool completely on a wire rack, 2 to 3 hours. Sever slightly warm or at room temperature. Do ahead: The pie will keep refrigerated for 3 days or at room temperature for 2 days. Corn syrup is a popular, core ingredient in pecan pie, but it’s gone out of favor in the last several years. The original recipe here calls for dark corn syrup. 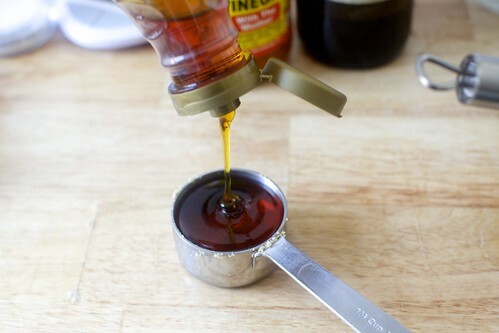 Should you wish to use something else, I highly recommend tracking down a bottle of golden syrup (a cane sugar syrup that tastes faintly like caramel, and is amazing on pancakes as well) as a go-to replacement. I haven’t tested this with honey, but feel confident it will work well here too, although it will of course alter the flavor. To emulate the “dark” part of dark corn syrup, I replaced 1 tablespoon of the syrup with molasses. The Elsen sisters use a trick to keep the bottom crusts of their pies from getting soft when covered with heavy wet fillings — they parbake the crust, then brush it with an egg white wash (1 egg white whisked with 1 teaspoon water) and bake it on for a few minutes and letting it cool before filling the pie. I suspect that this is a great trick to keep in mind when you’re making those slumpy berry and stone fruit pies to this summer, but I didn’t care for it here; it made the bottom too papery/firm, and very hard to cut through, so I’ve skipped this step. With a good gluten-free pie crust, this pie could easily be made fully gluten-free. And it’s already nut-free, if you love pecan pie but were being kept from it due to an allergy. Finally, as mentioned, I think these would make an awesome bake sale- and life-winning cookie bar. I’d use the base here for an 8×8 pan of thick bar cookies. I’d also be curious to see if this could be stretched into very thin bars (my preference; I might be no fun at all) in a 9×13-inch pan. For that, I’d double the crust first, because you’re still going to want a good “handle.” Let them chill in the fridge completely before cutting for the cleanest lines.